One of the major factors that interfere with a true possum living lifestyle is the governmental demand that we buy permission to travel, in the form of a driver's license, vehicle registration and insurance. Sure, you can still walk or ride a bicycle in most areas without the need to purchase these government permission slips, but that only works if you live within easy walking or bicycling range of the places you need to visit on a regular basis. In other words, close to town. But then you are subjected to similar regulations on your domicile. Towns and cities generally have high property taxes and worse, restrictions that prevent you living anything resembling a self-sufficient lifestyle. If only you could live offgrid on some cheap land out in the boonies, and have something like an old VW Rabbit diesel to drive to town periodically, while getting 60 mpg on biodiesel that cost $1 per gallon to produce at home; without needing to pay hundreds of dollars per year to the government for the privilege. And it is a privilege, right? That is what we have been told all our lives by the government. "Government, in requiring the people to file for drivers license, vehicle registrations, mandatory insurance, and demanding they stop for vehicle inspections, roadblocks, etc. are restricting and therefore violating the peoples’ common law right to travel." "Even the legislature has no power to deny to a citizen the right to travel upon the highway and transport his property in the ordinary course of his business or pleasure, though this right may be regulated in accordance with the public interest and convenience." Chicago Motor Coach v. Chicago, 169 NE 22. "The right of the citizen to travel upon the public highways and to transport his property thereon, either by carriage or by automobile, is not a mere privilege which a city may prohibit at will, but a common right which he has under the right to life, liberty, and the pursuit of happiness." Thompson v. Smith, 154 SE 179. It could not be stated more conclusively that citizens of the states have a right to travel, without approval or restrictions (license), and that this right is protected under the U.S. Constitution. "The right to travel is a part of the liberty of which the citizen cannot be deprived without due process of law under the 5th Amendment." Kent v. Dulles, 357 US 116, 125. Our system of law dictates that there is only one way to remove a right belonging to the people. That is by a person knowingly waiving a particular right. It is important to be aware of a different point of view about traffic since a near police state exists on America’s highways today. Excerpted from "Traveling Is A Right," by the Free Enterprise Society. I saw a question on an off-grid generator forum of which I am a member. The question went something like this: "I've seen a lot of information about solar (PV) systems, wind generators, and other offgrid power sources, but I haven't found much information about store-bought or home-built synchronizers for these power sources, beyond a few expensive inverters that have built-in synchronization. Where can I find more information on this subject?" I contributed my 0.02 there, then decided the subject was worth touching upon here as well. So, how do I synchronize my offgrid power sources? That's what the inverter does. Solar, wind and micro-hydro energy is stored as DC in a battery bank, then drawn out as needed by the inverter(s), which inverts it to regulated AC. There are only two scenarios I am aware of that require synchronization: combining two or more generators when the output of one alone is insufficient for a particular load, or combining a pair of inverters for 120/240 volt single phase operation. As noted, inverters which can do this are expensive, so most North American off-gridders just run the generator when they need 240 volts. Synchronizing a pair of generators can be a good idea, though. Let's say for example that you have a typical off-grid home that only needs a 5KW generator to power all its normal loads, whether it be the primary power source or backup to wind/solar/whatever. But let's say you also have a shop with a welder, air compressor, etc. You may need 8KW or more when you use the shop, even if you don't try to weld and run the compressor at the same time, and even if you totally disconnect the house loads from the generator while you are welding. Of course you could buy a generator big enough to power the shop, and you should if you plan to use the shop very much. Even better, you could have both a big genny for powering the shop, and a smaller one for efficiently powering the house. These could be on completely separate systems. That is a great way to do it for a couple of reasons. First, generators work better and use less fuel if they are operated at 75-80% of capacity. A generator uses a certain amount of fuel any time it is running. The greater the load on the generator, the smaller the percentage of total fuel usage is expended just keeping the generator online. It's kind of like a car: if it is not moving, it is getting zero mpg. Up to a certain point, the more load you put on a generator, the more efficiently it operates. A 5KW generator powers a 4KW total load quite efficiently, but a 10KW generator powering a 4KW load is wasting fuel. Second, even a very good quality 5KW generator is less expensive to buy, maintain and service than a 10KW generator. So why not put most of the wear on the smaller genny, and conserve the big one for the occasion that its capacity is really needed? But the point here is generator synchronization, and if you have a generator that is big enough to power your heaviest load, you don't need to synchronize them. Consider this scenario: instead of buying a big generator, you buy two smaller generators, each sized to power your normal household load. They can act as backups for each other, and you can periodically change which generator is active and which is backup, to equalize the wear on both generators. If one generator develops a problem that requires major service or even replacement, the homestead can continue to function normally on the second generator while the problem generator is in the shop. And here is where synchronization comes in: with a pair of 5KW generators, when you need to run the welder or other heavy load, you can run both generators to almost double the output of one generator alone. I say "almost," because nothing is 100% efficient, and you will incur some losses when you connect the two generators together. So, how do you synchronize a pair of generators? The easiest way to do it is to buy a pair of generators that are designed to synchronize together, and use the factory synchronization cable. Some Honda generators are designed this way, and I'm sure there are others, as well. But it is possible to synchronize a pair, or even three or more, generators that lack the factory synchronization hardware. One would assume that generator controllers would be available to the off-gridder who wishes to parallel two or more generators. Unfortunately, that is not the case, and for a very good reason: an automatic generator paralleling controller is a very complicated and expensive piece of equipment, and a manual controller requires a level of understanding of how generators work that the average generator owner simply does not possess. With that in mind, here is a description of how it can be done. Do not use this as a set of instructions. This is not enough information to constitute instructions. You should only attempt this if you are confident in your knowledge of generators and electricity and understand exactly what you are doing. If you do this and something goes wrong, I am not responsible. With the forgoing in mind, here is how it works. Do not think of this as paralleling two identical generators; think of it as adding generators to a live bus. The live bus is one or more generators that are already running. To begin with, it will be one generator, and it should be the largest generator if they are not the same size. You will have to match the voltage, frequency, and most importantly, the phase of the generators before you connect them. To do this you will need three AC voltmeters. One goes on each generator, and one goes from one leg of the fist generator to one leg of the second generator. You will also need a frequency readout on each generator. You can get by with a multimeter that has a frequency readout, and use it to measure the output of each generator individually. 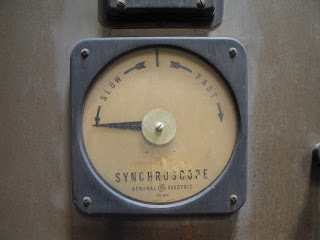 But for the phasing meter (the one that connects between the two generators) you really need an analog meter that is capable of displaying double the voltage of the generators. An analog meter allows you to track the voltage changes; a digital meter doesn't. Some people have successfully used a pair of light bulbs connected in series across the two generators, but this is a pretty imprecise method. A better way to monitor the generators, instead of a multimeter, is to use a dual-trace oscilloscope. If you do this, you should still use an analog voltmeter across the generators, just to make sure you are getting it right. Another thing you will need is a voltage (field) control circuit on at least one generator, and governor speed control of the generator you will be adding to the live bus. Once you have the two generators connected to the load, you will need a means of measuring the current each generator is supplying. Start both generators and allow them to warm up. Connect the most powerful generator to the bus, and adjust its voltage and frequency to the correct levels. With the second generator running but disconnected, adjust its speed so that its frequency exactly matches that of the live bus. Then adjust its voltage to also be the same as the live bus. Now manipulate the governor control of the unconnected generator so that its frequency and voltage lags that of the bus. What will be happening at this point is best described in racetrack terms: the bus will be "lapping" the unconnected generator. Watch the analog voltmeter that is connected across the two generators. The voltage will be rising to the combined voltages of the two generators (double the voltage of one leg) when the generators are 180 degrees out of phase, and falling to zero when the generators are in phase, then rising again. Gradually increase the speed of the unconnected generator so that this rise and fall is as slow as possible. Then when the voltage is at zero, connect the second generator to the bus. At this point, you can begin adding loads to the bus. Monitor the current drawn from each generator, and try to maintain equal load percentages on each generator. For example, if the first generator can handle 7,500 watts, the second generator can handle 5,000 watts, and the load is using 3,600 watts at 240 volts (15 amps), the governor of the second generator should be adjusted so that it supplies approximately 6 amperes, with the remaining 9 amps being supplied by the larger generator. Theoretically, that should allow the two generators to respond similarly when you apply a larger load. It will not be precisely what the calculations say it will be, but so long as you monitor it to prevent either generator from overloading, it will be fine. If necessary, you can add a third and even fourth generator to the bus in the same manner. Just keep in mind that losses increase and efficiency goes down with each generator you add. There is one other way to increase capacity of your setup while actually increasing the efficiency in the low-power mode. I will address that in a later article. Consider which people you'd like to come with you on your journey. These people should be in need of some fun, and willing to have it. They need to be prepared to rough it at times and to be stuck in the car for hours at a time when you just keep on driving. It also helps if each person coming along is able to and is willing to drive for some of the way, so that you can share the driving chore (with the obvious exception of children). Read How to take a road trip for your family and How to take a road trip with a friend for more ideas. Take a day or evening to get together with these folks to brainstorm ideas for your trip. Dinners and shopping trips are great ways to do so, but over a few cocktails is the best way for many to get their creative juices flowing. Planning the trip should be fun and get people excited. Don't stress about the details or you're completely defeating the purpose. Even a general idea of a direction can be sufficient, with maybe a much desired place or site to visit included as one must-do or a turn back point. There are plenty of online planning sites that will help make it super easy for you to plan a rough itinerary and to get travel times, etc. Using these can speed up the decision-making process. Get an idea of how long your trip will be, and what types of places people may want to visit. The only thing that you need to bear in mind as you amble along on the road trip is the return date. It's not going to be very helpful to be in San Francisco when you need to be in New York City the next day or so. Some planning is essential to ensure that your road trip gets you back to where you came from on time! In addition, if there are particular must-do visits, find out times of opening, dates of special events, and the accommodation needs. If you're heading to a festival or similar event, accommodation may be booked out if it's popular, so you might need to be prepared to sleep in the car or rough it in bivouacs; at least know beforehand so that you can be prepared. Set a budget and stick with it. If you're low on cash, make a pact to stay in cheap hotels and skimp on the dining out. Also pack well, so that you have towels, blankets, sleeping bags, food supplies, etc., that will help to keep down the costs if you need to rough it or you drive into town too late for a decent meal, etc. Some suggestions for things to pack are outlined in later steps. Have at least one credit card for emergencies, preferably one per person, as well as small amounts of cash for the cash-is-best deals such as cheap accommodation and meals. Plan ahead for prices of fuel using sites such as gasprices.mapquest.com or roadtripamerica.com (both USA sites). If you stop for a swim after roughing it for the night, use their showers to clean up. Other places to find showers include camping grounds and RV parks but usually you'll have to pay for the privilege of a shower in these places. Stay in national parks and state/provincial parks (you'll need an annual pass). If you do this, it will cost very little each stay and you will get the benefit of a car space and a tent space (just be sure to take your tent), as well as basic hygiene facilities. And there is nothing like waking up to the sounds of nature in the early morning. Avoid toll roads and big city stops and you'll avoid having to pay for road usage and parking. Take an up-to-date road atlas with you so you know how to avoid the tolls. Read How to choose a camping spot on a road trip for more ideas. Check the car. Your most important element of a road trip is your car, which needs to be both reliable, fuel efficient, and safe. Obviously, start with a car in top working order and have it serviced before leaving. Spending most of the road trip stuck in a garage won't be fun, so spare yourself such a nightmarish outcome by having the car checked first. Some things you might need to consider include wheel realignment, tire changes, fresh oil, fixing a chipped windshield, checking clutch and brakes, and general condition of the engine. Once you're satisfied the car's in great shape, you have one big weight off your mind. Have the spare tire checked too. And if you don't have one, get one now, along with a jack. Ask the mechanic to show you how to change a tire if you don't know already; it's better to be slightly embarrassed now than to be frustrated in the middle of the desert with nobody for miles to help you. Check that there are jumper cables in the car. You'll also want to make copies of the car keys and give everyone one set. This will keep you from getting locked out, and will be more convenient when you switch drivers. It also helps should one person lose their set of keys; at lease one other person will have a back-up! Be sure to sign up for roadside assistance, such as the AAA. As well as roadside assistance, often such companies can set you up with free maps and even directions to your final destination. If possible, choose the most fuel-efficient car over any gas guzzlers. Read How to check your car before a road trip for more information. Pack supplies. Some planning for contingencies is important. Food, sleeping items, clothing, and water are essentials to add to your packing so that you're self-reliant. Be sure to wear and take comfortable clothing as you'll be sitting for long periods and time and you don't want to feel hot and constricted. Include some sleeping gear. Have at least one sleeping bag, one pillow, and one polar fleece or cotton blanket per person traveling. Add a tarpaulin or two for all sorts of purposes and some dish cloths/hand towels or similar for quick makeshift curtains for the car windows if you have to sleep in it overnight. Throw in some activity gear, like a soccer ball to kick at road stops, a Frisbee to throw, and a pack of cards for a game or two at a cafe. Include paper towels, utensils, dish cleaning gear, storage and garbage bags, and spare toilet paper. All these "just-in-case" items can help save money and get your out of a tight spot. Remember you may be traveling through the middle of nowhere pretty frequently and will need to pack a few safety things. Bring a gallon (3.7 liters) of water and a gallon (3.7 liters) of oil. Bring 50-100 feet (15 to 30 meters) of rope, duct tape, a first aid kit, a flashlight (the kind that doesn't use batteries is nice because you don't have to worry about batteries), bug spray, jumper cables, a pocket knife, a compass, an umbrella, and blanket(s). It can also be helpful to have an electricity convertor for charging your music players, laptops, cell phones, etc. If you plan on crossing country borders, have your passport and any visas needed, as well as checking that your passport has enough time left on it. Take care of food and snack needs. Food is one of the most important aspects of the trip, especially if you're trying to drive cross-country in two days. If you want to cover the most ground, you can't stop to eat too often. If you're concerned about health, you shouldn't do drive-throughs all the time, either. Indeed, if you eat a poor diet while on the road you'll be sleepy and less aware, increasing the risk of accidents. Be prepared to pack things you may not like to eat, but must anyway. Snack or energy bars are a great choice, as well as fresh fruit, cereal, nuts, seeds, trail mix, etc. For cooking purposes, take along some seasoning, pasta, quick-cook rice, and camping style food packages, and you can pick up fresh fruit, veggies, fish, and meat as you travel, especially from local farmers and fishing operations – fresh is best and that's part of your discovery experience on a road trip. It's especially important to carry plentiful supplies of food if you have dietary restrictions, such as gluten intolerant, vegetarian, etc., as the roadside diners won't always have what you can eat. Find a good, collapsible cooler that will not take up any more space than one seat and pack it full. Buy ice packs or sealable bags and fill them with ice. Do not put ice directly in the cooler because when it melts it will be a pain, and you'll need to get more ice at every stop; always have it in a container. If you stay in overnight accommodation, an icepack can be refrozen in the bar fridge but remember to take it with you each time. You can always bake cookies, eggs, or other food on your car engine if you bring along some aluminum foil and seasoning! See How to bake cookies on your car dashboard and How to cook food on your car's engine for inspiration. Read How to keep food fresh on a road trip for more ideas. Pack a map and/or GPS. Always have paper maps or a map book with you, even if you have GPS. Something could go wrong with the GPS and you don't want to be stranded just because it's all you relied upon. Have each person create a mixed CD with a theme for the car ride. For example, one with all music that reminds them of summer, music that was popular in junior high school, etc... Each person should bring items to the car that coincide with this theme, such as candy, tiaras, cheap sunglasses, tie-dye... you get the picture. It's funny if you keep these details a secret until you hit the road. Never pass or overtake on blind bends or hills, no matter how confident you start feeling as you keep on driving. Another car or truck coming the other way has nothing to do with your confidence! If you feel as if you've done enough driving for the day, heed that feeling. Pushing yourself beyond your limits puts you into the danger zone of drowsiness, poor reaction time, and bad decision-making. Any drowsiness should be heeded; find the nearest rest stop, pull over and take a good 20 minute break that includes stretching, walking, and perhaps eating and drinking. Heed the space needed for large vehicles such as trucks, RVs, buses, etc. when overtaking or passing them, as well as giving them wide berth when they're turning. Remember that if you can't see their mirrors, they cannot see you; pass by them quickly but safely, and don't cut in too soon when pulling back in. Have one person sleep, and one person awake, if you happen to be traveling at night. If you have to drive through the night and everyone is tired, take shifts that are 1 hour 45 minutes long. Everyone sleeps in cycles, and these cycles are typically 1.5 hours long. Adding the extra fifteen minutes allows for you to settle in and get to sleep. It's also best to begin waking the next person up a few minutes before you actually stop. To stay awake: drink caffeine, eat crunchy things like apples, shine lights into your eyes, roll down the windows, turn the music up (unless this wakes up the others), bite your cheek, pinch yourself, or change lanes frequently. Read How to stay awake when driving for more details. Sleep with care if car-bound. If you choose to sleep in the car, take care with your choice of sleeping location. Look for areas that are well lit, out of the way of pedestrian or vehicle traffic, and that aren't likely to have traffic patrol knocking on your window! The car park of the motel that told you they're all full might be a good location, especially if you're all really tired and fed up looking for somewhere to sleep. These are often well lit and out of the way of traffic; however, beware the possibility of thieves trying to break into cars that might be surprised by people in a car! Camping grounds and RV parks can be a spot to park (for a cost) but not actually get out of your car. This will still cost you but can save time by not setting up a tent if you're in a hurry. Well-lit truck stops are a good choice for sleeping. Many truck drivers use them, so it's a generally accepted habit in such places. Travel against peak traffic or outside peak times when traversing cities and large towns. There is nothing more frustrating (and somethings scary) than a free-as-a-bird road trip getting snagged in a traffic jam as you're transiting through an unknown city to get to the other side. Check the traffic flow (jams usually occur into big city centers in the early morning and away from them in the mid to late afternoon) and avoid going that way. Or, opt to transit through when the traffic is only non-peak. If you do get caught up and you're feeling drained of energy, frightened by the traffic, or tired, take the first exit and wait it out. Use it as a chance to explore wherever you've turned off to, or to get a coffee. Head out and enjoy the drive! Once you've taken care of all the planning, checking, and you're fully aware of how to deal with any of the risks and problems that can crop up, it's time to head off on your road trip. The road trip will be as monumental, amazing, and memorable as you decide to make it, so don't be hung up by preconceived notions or unrealistic ideas. If things interest you along the way that you didn't expect to, give in to the whim and discover something completely new. You won't regret discovering and exploring new aspects of life around you and you may even meet the most incredible people. If you're in a different part of the country, take the scenic route whenever you can. You may be surprised how different and beautiful your country can be. Be spontaneous. If you see a billboard for some off-the-wall store or a crazy attraction, go. Don't get caught up in an itinerary or time schedule. Wherever you go, make sure you go out on the town and mingle with the locals. Do your best to avoid eating at chain restaurants. Local restaurants are much better 95 percent of the time and much more fun 100 percent of the time. Besides, you're more likely to meet some great characters at local diners and restaurants. Play the game "I spy": Pick an object everyone can see and say "I spy with my little eye, something beginning with [insert letter]; or something that is [insert color/size]". Whoever guesses correctly gets to go next. Play "Guess the license plate": Spot where cars come from and work out the state or province, perhaps even country, that they're from. The winner is the person who has seen the most states/provinces by the end of the road trip. (It's probably a good idea to keep a record in a small notebook.) Or, vary the game by using the letters of each license plate to make a phrase, such as "CBD" could be "cows in broad daylight", etc. Play "Scavenger hunt": Have someone draw up a list of items that have to be spotted during the set time. The first to check off all the items on the list wins. Play "Count the cows": Count as many cows or other objects as possible within a defined period of the trip. Passing a cemetery loses you all your points and you have to start again. The winner is the one with the highest count. Play the "Alphabet game": Search for each letter of the alphabet on your side of the road, in signs, storefronts, on vehicles, etc. The winner is the one to get the whole alphabet first. Play "Storytelling": Simply relate a line, then the next person has to make up another line, and so forth until a whole tale is spun. The crazier, the better; have a good laugh! Read How to choose kid's games for road trips for more ideas. And don't forget sing alongs! Enjoy the developing relationships on board your road trip vehicle. As you travel together, you'll get to know one another more than ever. If you and your fellow road trippers start arguing, falling in love, discovering deep and meaningful things about one another, etc., take the time needed to sort through your feelings and exchanges with each another. This is definitely a part of the road trip - bonding and learning more about one another, so don't simply ignore anything and let feelings get out of control. Stop and listen to one another! Being in such close proximity for so long with certain friends can lead to the friendship reaching break point. If so, this can be especially awkward when you still have to drive 1000 miles back home with the guy, so be sure to take "breathers" every now-and-then so you don't get on each others nerves. Keep a record of your road trip. Finally, but not least, keep your memories of the road trip alive for the rest of your life by documenting it in digital and written form. At the very least, take pictures! No matter where you are or what you're doing, if you don't, you will regret not taking pictures of your experiences. As well, try to keep at least a bare bones daily record of the places you've visited and traveled through. If you also have the energy to write down your feelings, do that too. All of these memories will bring the trip back to you in years to come. Digital is the way to go when taking travel photos. Just make sure you have plenty of fully-charged batteries and adequate storage capacity. If memory cards get full they can be downloaded to CDs at the photo departments at big box stores and pharmacies anywhere. Or, if staying with family or friends, just use their computers to backup to disc. Don't be miserly with the photos; take many and there will be at least one gem per round of shots of the same monument, scenery, or feature! Photograph such structures as a bridge crossing between states, border signs, motels where you slept and have a funny story to tell, interesting signs, etc. Make a checklist of photos that must be taken by each person on the trip. For example, each day someone must take a picture with a random family, a garden gnome, a monument, a particular franchise, a church, etc. Take a picture of one person at each state or provincial line. While it may be tacky, you're guaranteed laughter and these photos will make great keepsakes later on. Be sure to get lots of photos of your traveling companions. And if you can, get their daily or regular impressions of the trip too and write these down. If you plan on staying in hotels or motels, make reservations before leaving so you're assured a place to stay. Use your cell phone to both locate and book such places as you're traveling in the region. Use time estimators on maps to let the motel know your likely arrival time but it also helps to tell them where you are currently so that they understand if you're later than you said you would be. If traveling with kids and/or pets, make all necessary arrangements to bring their gear and to take good care of them. Both need frequent stops, frequent feeding, good ventilation at all times, entertainment, and reassurance. It can be done but it will make your road trip experience a little more "responsible"! If planning on staying with friends or family anywhere along the way, be sure to ask first and don't just assume that they have the room, time, or interest in having you. Be polite and make sure they have room for everyone. If it's clear they feel awkward, let them know it's no problem and suggest that you simply catch up for coffee or a meal together instead. And you can always visit couchsurfing.com if you really need to bunk down somewhere free. Cell phones are to fun as sponges are to spills. Each member of the trip should hold another person's phone to ensure adherence to the rule. Only take them out if you're going to make accommodation or emergency calls. Or you could prank each other! Dumpster dive! many places throw away good food constantly! Supermarkets throw away everything, cafes throw away pastries and bagels and what's better than a doughnut log? Always have a tent in the trunk. You never know when it may come in handy. If possible, hire a caravan; it will be easier to store food, sleep and maybe watch some movies. Bring a car charger for your cell phone. If you want to work during the road trip, look for seasonal work, look in local employment gazettes, visit a temp agency specializing in day work, help people set up at events or swap meets, find out what events are on by asking at the local Chamber of Commerce that you might be able to get work at, and visit resorts to see if any casual work is available. Did you know? In the USA, highway routes that run north and south have odd numbers, while highway routes that run east and west have even numbers. While not knowing where you'll end up is part of the fun, be sure you at least have a general idea of how you'll get back home, or you could be in trouble. Don't drive so far that you can't afford to get back. Follow all road rules/regulations when traveling out of state (s) for the first time ever. You want to be safe and still have your fun, and that includes wearing your seatbelt. Avoid picking up strangers or hitchhikers. It's dangerous and can end badly. Be alert all the time to possible problems. Don't overstate anything but be aware of possible dangers from animals on the road to people stealing things from you..
Don't rat out your friends for embarrassing things they did upon your return. Most probably they'll tell a story about you if you do that. Choice of music can cause some dissension amongst the ranks if the tastes are vastly different. If there is argument, let the driver choose. Don't continue driving when you are tired. Use the advice in the tips section only to keep you alert until you reach the next rest stop. Don't hesitate to wake someone else up if you are tired! Short-term sleep (even if it lasts only 1 or 2 seconds) can lead to fatal car accidents. Don't risk it. How to Check Your Car Before a Road Trip. Article provided by wikiHow, a wiki how-to manual. Please edit this article and find author credits at the original wikiHow article on How to Take a Road Trip. All content on wikiHow can be shared under a Creative Commons license. We had yet another power outage today. I waited about 20 minutes to see if it would come back on, then started the generator. That seemed like a good opportunity to do a short video and writeup about how I connect the genny to the wiring in my home, so here it is. Note that I said how I do it, not how you should do it. This information is presented for its entertainment value and should not be construed as practical advice. This can be dangerous and may even be illegal where you live. The generator is the same Changfa I have featured in some other videos. I have had the basic generator for years, but the original Changchai S1100 needs an overhaul (after which it will probably become a boat motor) so I replaced it with a Changfa S195 engine that I bought new for that purpose in 2007, and have only recently gotten around to installing. Both engines are of the same design, and as far as I have been able to determine, all of these engines use the same stroke of 115mm. The bore or piston diameter is what varies, and the "1" refers to number of cylinders. Thus, S195 is a single cylinder with 95mm bore and 115mm stroke for 815cc; S1100 is a single cylinder with 110mm bore and 115mm stroke, and S1115 is a single with 115mm bore and 115mm stroke. They all make maximum power at around 2000-2200 RPM, and most generator applications (this one included) direct-drive a 4-pole generator head at 1800 RPM for 60 cycles. This is a good RPM at which to operate these engines. 1500 RPM works well too, and is the proper speed to turn a 4-pole generator to produce 50 cycles for our British cousins. Both of my engines came equipped with a radiator mounted atop the cylinder, with a belt-driven fan to force air through the radiator. This is a really poor excuse for a cooling system, especially if you run antifreeze in it. For one thing, it absolutely relies upon that fan belt doing its job, as it does not hold enough coolant to work for very long without it. For another, in cooler temperatures it can over-cool the engine, resulting in poor efficiency, carbon buildup in the combustion chamber, and increased engine wear. With antifreeze in the mix, the temperature can go far above optimal operating temperatures on a hot day, even if it did have enough coolant in it. Early in the life of the S1100, the belt got loose, started slipping and eventually broke while it was running unattended while loaded. The radiator boiled over and then melted down, and the piston skirt expanded enough to greatly increase friction in the cylinder walls and shut down the engine. The engine survived and ran fine after this event, but I had learned my lesson. I set that engine up with a thermosiphon tank-cooling system. I spent a lot of money on 25 gallons of antifreeze to achieve 50 gallons of 50-50 coolant for my 55 gallon drum cooling tank. That was still not a good way to go; the 50-50 mix still allowed the temperature to rise too high on a hot day. If I had used pure distilled water or rainwater, I could have used much less water for cooling and let the boiling point of pure water set the operating temperature. I have since figured out that hopper-cooling with pure water is a brilliant, deceptively simple means of cooling an engine. The millions of engines like this that are used for all kinds of chores all over the world mostly use hopper cooling because it is simple, cheap and works well, but the fact of the matter is that it doesn't just work well; it works better than anything else you can come up with. It happens that the boiling point of pure water is a nearly ideal temperature to run an internal combustion engine. In the winter, just drain the water out of the engine and hopper when it is not in use. Store your cooling water in the house in jugs. In fact, set the jugs near the woodstove or whatever, and pour warm water into the hopper to pre-warm the engine when you are ready to start it. The hopper on this engine is the one I was welding up in a previous video about welding with an automotive alternator. Ok, on to the description of how I connected the generator to the wiring in the house. I needed electricity in my shop to power lights, power tools and welders. I can get by with only 30 amps at 120/240 volts, because the largest welding electrodes I use are 1/8-inch so I never need over about 140 amps of welding current, and 30 amps at 240 volts can supply that. I just have to be sure to turn off the air compressor before I weld. I had a scrounged breaker box from a house I helped to rewire, so I mounted that in the shop and spliced into the dryer circuit of the house to feed it. That means I can't weld while the dryer is running, either. No biggie; I used to live offgrid so I understand power management. Go to the service panel and switch off the main breaker. This is of utmost importance; never allow the main breaker to be on when the generator is connected. Switch off the breaker that controls the dryer. Go to the dryer. Unplug it and plug the generator connector into the dryer outlet. Go outside and ready the generator for starting. Make sure the breaker is switched off. Check the oil, fuel and cooling water. Add fluids as necessary. Start the generator and let it warm up. Go back in the house and double-check all connections and especially make sure the main breaker is off, while the generator is warming up. Practice power management: switch off the breakers to any non-critical loads and heavy loads that I do not want starting all at once. Also switch off loads that are too large for the generator, such as a central HVAC system if I had one and my generator wasn't large enough to handle it. Switch off the breaker to the electric stove and water heater. The water heater stores hot water for a long time, and I can always switch it on to run for a cycle later, if necessary. Go outside, bring the now-warm generator up to full speed, and switch on its breaker. Go inside, check that the main breaker is still off, and switch the dryer breaker on to power up the house through its circuit. And that's it; I am running on generator power. When I am ready to switch back to public utilities, I use the following order of operations: switch off the dryer breaker, go outside and switch off the generator breaker, shut down the generator, unplug the generator cable from the dryer outlet, plug the dryer back in, and switch the main breaker back on.